High School Equivalency Achieve® is a groundbreaking blended test-prep program that helps adult learners prepare for high school equivalency exams more quickly and retain more of what they learn. 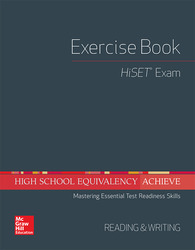 It is aligned to College and Career Readiness Standards for Adult Education and built upon the new standards and assessment targets for the 2014 GED® Test, TASC™ test, and HiSET™ Exam. Contextualized skill instruction engages learners while preparing them for test success, postsecondary credentials or certification programs, and family-sustaining careers.